Fidelity offers low commissions, an impressive choice of no-transaction-fee mutual funds, and top-notch research tools and trading platform. The Bottom Line: Fidelity is a well-rounded broker with low costs, useful tools and abundant investment choices. Large selection of research providers. Trade minimum for active trading platform. Fidelity Investments has a strong reputation for its mutual funds, but its brokerage arm is no slouch either: It has low commissions, a swath of research offerings and an easy-to-use platform that also can be customized for more advanced traders. Fidelity also stands out for a few changes it made last year: The broker now offers a selection of Fidelity Zero index funds, which have no expense ratio and no minimum investment requirement. Fidelity also did away with account fees and account minimums. These investor-friendly moves could save customers a lot of money. Commissions: Fidelity charges just $4.95 for a stock trade, and that's cheap among online brokers, especially for the level of service the company provides. The company also recently did away with nearly all account fees, including the transfer and account closure fees that are commonly charged by brokers. Fidelity also offers over 260 commission-free exchange-traded funds, a comparatively large number when stacked against other brokers. Mutual funds: The war among brokers to cut mutual fund fees has brought good changes to Fidelity: The company is the first broker to bring to market index funds with absolutely no expense ratio: the Fidelity Zero Total Market Index Fund, the Fidelity Zero International Index Fund, the Fidelity Zero Large Cap Index Fund and the Fidelity Zero Extended Market Index Fund. Investors could build a balanced — and virtually free — retirement portfolio out of these zero-expense-ratio funds alone, but even the Fidelity index funds that do charge an expense ratio undercut much of the competition on price. No account or fund minimum. Fidelity has long required no account minimum, but like other brokers, its proprietary mutual funds required a minimum initial investment. That's no more: Fidelity has removed the minimum from the majority of its Fidelity funds. This means investors can get started right away. Research: Fidelity is unmatched here, with stock research from 19 providers, including Recognia, Ned Davis, Thomson Reuters and McLean Capital Management. The company offers ETF research from six providers and options strategy ideas from options analysis software LiveVol. 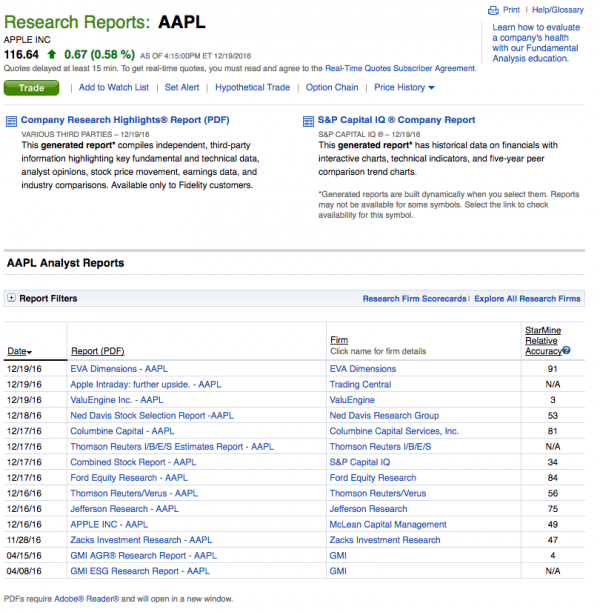 Stock quote pages show an Equity Summary Score, which is a consolidation of the ratings from these research providers. 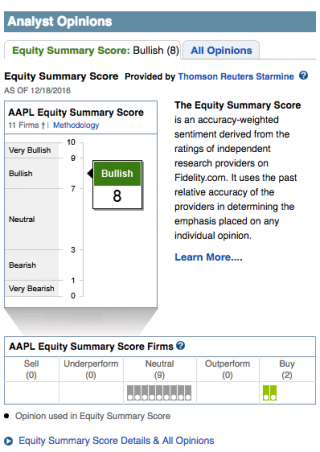 It gives an “accuracy-weighted sentiment derived from the ratings of independent research providers on Fidelity.com,” according to the website. This number of research firm offerings might seem like too much to wade through, but investors can take a short quiz to identify providers that match their investment style. A research firm scorecard evaluates the accuracy of the provider's recommendations. Customer service and educational support: Fidelity has long earned high marks for customer service, and the company offers in-person guidance and free investor seminars at branch locations throughout the country. Seminars cover such topics as how to navigate the company’s website, when to take Social Security, and the basics of technical analysis. Online, Fidelity’s learning center offers guides and webinars on a similar range of issues. In this category, we also factor in the ease of finding key information on a broker's website, and our testers were quickly able to locate information about required account minimums, investment options and the process of closing an account. Platforms and tools: Like other brokers, Fidelity offers trading via its website and mobile apps, plus a desktop platform for active traders. The company’s online trading platform is easy to navigate and fairly comprehensive — highlights include advanced screeners using the aforementioned research and strategy-testing tools based on 10 years of historical data. Fidelity’s mobile app is equally impressive, with real-time quotes, multi-leg options trading, a consolidated version of the company’s research offerings, and a notebook where you can save ideas and articles from your mobile browser. Active traders will prefer the company’s Active Trader Pro platform, which is available to all investors for free as of this year. Active Trader Pro includes both a downloadable desktop version and a web alternative at ActiveTraderPro.com. Investors can toggle seamlessly between the two. The customizable platform includes intuitive shortcuts; pre-built market, technical and options filters; advanced options tools; and a multi-trade ticket that can store orders for later and place up to 50 at a time. Finally, the company’s Wealth-Lab Pro is desktop-strategy-testing software that allows investors to customize strategies and access up to 20 years of daily historical data. Wealth-Lab Pro is a premium product, available only to customers who trade over 36 times in a rolling 12-month period and have a minimum of $25,000 in assets in eligible Fidelity brokerage accounts. The company does offer a free 30-day trial to those who aren't eligible. A tough-to-earn promotion, which requires a minimum deposit of $50,000 to earn free trades. A broker-assisted trade fee that is higher than we like to see, at $32.95. Fidelity's got a great rep for mutual funds, strengthened further last year by the addition of several no-expense-ratio index funds. However, the broker should be known just as well for stock trading. With a strong trading platform, low commissions and an easy-to-navigate interface, Fidelity offers a solid experience for beginning investors without sacrificing anything that advanced investors might need. Those looking for research will also be pleasantly surprised. Fidelity is strong all the way around.